Enter Rome at the time of the slave uprisings under Spartacus. The escaped rebels have managed to gain influence and power. Rome is attempting to undermine the stronger armies of the slaves in order to restore PAX, or peace - but only for personal gain. 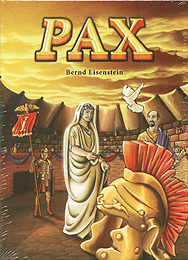 PAX is a multi-faceted game of card management and influence, in which each card requires a tricky tactical decision.